WIZnet (http://www.wiznet.co.kr) provides Hardwired TCP/IP chips, embedded Internet modules, external devices, and serial device servers in wired and wireless environments. Sometime the business is going very well, just after some email from the unknown people, that’s the case I met with WIZnet, the company in Korea. Meeting with Mr. Kit Wan in Shenzhen, China (2009) and WIZnet team (Mr. Jace Sohn, Mr. Kit Wan,..) in Dongguan, China (2010), there’s many stories to tell. Keeping the good relation ship, my friends! 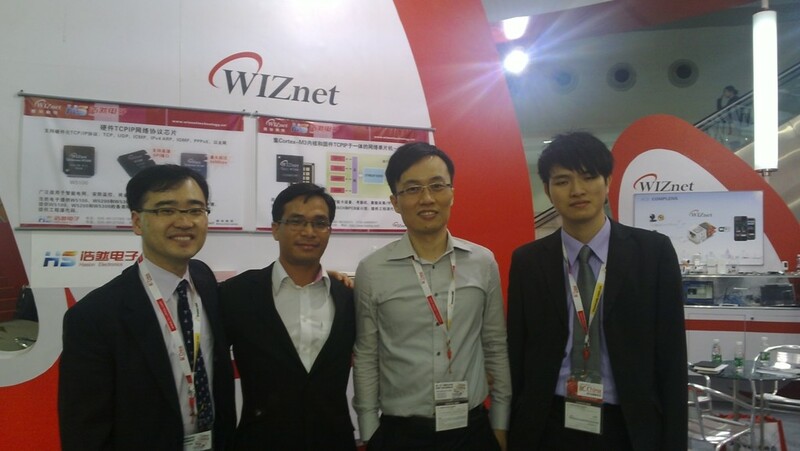 UPDATE: Picture taken with WIZnet Hong Kong team at IIC 2012. Hello.This article was really motivating, especially since I was investigating for thoughts on this issue last Monday. Very good written article. It will be helpful to everyone who usess it, including yours truly :). Keep doing what you are doing – for sure i will check out more posts. Well I really liked reading it. This post procured by you is very practical for proper planning. I’m still learning from you, while I’m trying to reach my goals. I absolutely liked reading everything that is posted on your website.Keep the tips coming. I loved it! I’m still learning from you, as I’m making my way to the top as well. I definitely liked reading all that is posted on your website.Keep the posts coming. I loved it! I am commenting to make you be aware of what a fabulous experience our princess developed reading through your site. She figured out such a lot of issues, which included what it is like to have a marvelous teaching mindset to let other people with no trouble have an understanding of certain tortuous matters. You actually exceeded my expected results. Thanks for coming up with those beneficial, trusted, explanatory and as well as fun guidance on your topic to Kate. The following time I learn a blog, I hope that it doesnt disappoint me as a lot as this one. I mean, I know it was my option to read, but I really thought youd have one thing interesting to say. All I hear is a bunch of whining about something that you might fix in case you werent too busy searching for attention. Very well written post. It will be valuable to anybody who utilizes it, including myself. Keep doing what you are doing – for sure i will check out more posts. of course like your website but you have to check the spelling on several of your posts. Many of them are rife with spelling issues and I find it very bothersome to tell the truth nevertheless I will surely come back again. Hiya! I just want to give a huge thumbs up for the nice information you could have here on this post. I can be coming again to your weblog for extra soon. Great – I should definitely pronounce, impressed with your website. I had no trouble navigating through all the tabs as well as related information ended up being truly simple to do to access. I recently found what I hoped for before you know it at all. Reasonably unusual. Is likely to appreciate it for those who add forums or something, web site theme . a tones way for your client to communicate. Excellent task..
I’d must examine with you here. Which isn’t one thing I usually do! I get pleasure from studying a post that can make people think. Also, thanks for allowing me to remark!